DeZURIK’s Unival incorporates a technologically innovative sealing mechanism with features that surpass any other ported gate valve. Unival has undergone extensive field testing in abrasive, corrosive and scaling applications in the mining and process industries. The field tests have demonstrated the superiority of this design in terms of quality, extended service life and reliability. All of the features of Unival were designed to reduce downtime and save money. The improved packing sealing system and the pressure-assisted seat were engineered to provide trouble-free operation and extend the service life of the valve. Unival Valves feature a full-port design. The valve does not intrude into the flow path, thereby reducing turbulence, abrasive wear and premature valve failure. Because there are no intrusions into the flow path or irregular geometry, head loss is minimal. 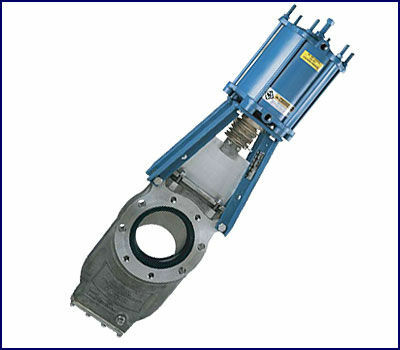 Unival Ported Gate Valves feature standard MSS-SP-81 face-to-face dimensions on 2-24” (50-600mm) valves. No piping changes are required to change from competitive gate valves to Unival. In addition to ANSI 150 wafer drillings, Unival Ported Gate Valves are also available with other international flange drillings, including DIN, BS, AS and JIS. Unique design allows Unival to be used on dry service applications including, but not limited to, powders, plastic pellets, fly ash, Kaolin, lime and sand. Unival Ported Gate Valves provide bi-directional shut-off and are rated to accept a 150 psi (1,000 kPa) pressure drop. When required, the sleeves can easily be replaced by simply removing the mating flange. Changing the sleeves does not require disassembly of the valve or actuator. This greatly simplifies maintenance and means there are fewer parts to stock. The standard packing is a multistage adaptive system that forms the secondary atmospheric seal. This exclusive packing system provides excellent wear resistance and overcomes traditional cold flow problems and strength issues. One common mounting pad allows quick and easy conversion from manual to powered actuators with no major changes in parts or valve construction. All that’s required is removal of six bolts. The valve can be ordered without the lower-body seal. The lower-body cover can also be removed for easy inspection and clean-out when the valve isn’t under pressure. Positive pressure applied to the purge ports prevents build-up of material in the lower body. Chest-area purge ports are provided on valves for dry services, and available as an option on wet-service valves. To increase packing life and provide a superior seal, the gate edges are rounded. The rounded edges reduce packing stress and operating forces and provide longer packing life. As standard corrosion protection, fasteners are 316 stainless steel. The superstructure is carbon steel and available in 304 and 316 stainless steel. One hundred percent stem protection is provided, as standard, on all valves. The standard gate material is 316 stainless steel. To meet more demanding corrosive and abrasive applications, DeZURIK offers a variety of gate materials, including 317 stainless steel, titanium, Alloy 20, Hastelloy or any available alloy or plate material. As standard, a closed-position lockout device is supplied on all Unival Valves. It conforms to OSHA lockout/tag-out requirement 29 CFR 1910.14]. A quick disconnect may also be specified with the lockout when required. Unival Ported Gate Valves feature a unique pressureassisted sealing system. This patented design utilizes elastomer sleeves with radial support rings and gate-thrust support rings. The seats rely on line pressure, rather than compression, to assist the sealing process. The upstream pressure on the seat provides the primary seal. This innovative new pressure-assisted sealing system provides longer seal life. Unival Ported Gate Valves provide bubble-tight, bi-directional shut-off. In the open position, both seats provide a pressure-assisted seal. In the closed position, the upstream seal is line-pressure assisted. This innovative design includes thrust rings to support the full load of the gate. The thrust rings absorb the stress of gate movement throughout the valve stroke, keeping the gate centered in the body and packing chamber.